People who are in deep emotional suffering will sometimes become so desperate that they will use whatever tool accessible to decrease the pain, even if it is just for the moment, and the long term consequences are severe. The inability to accept and cope with emotions is at the core of most destructive behaviors and by training skills that helps manage these emotions instead of acting on them you avoid both the negative consequences of your behaviors and decreasing the emotional suffering. We want to make a difference and bring the skills out of the therapy room and into the lives of those that so desperately need it. We know that by training these skills you can change the way you manage your emotions and how you manage your life and by doing that building a life worth living. 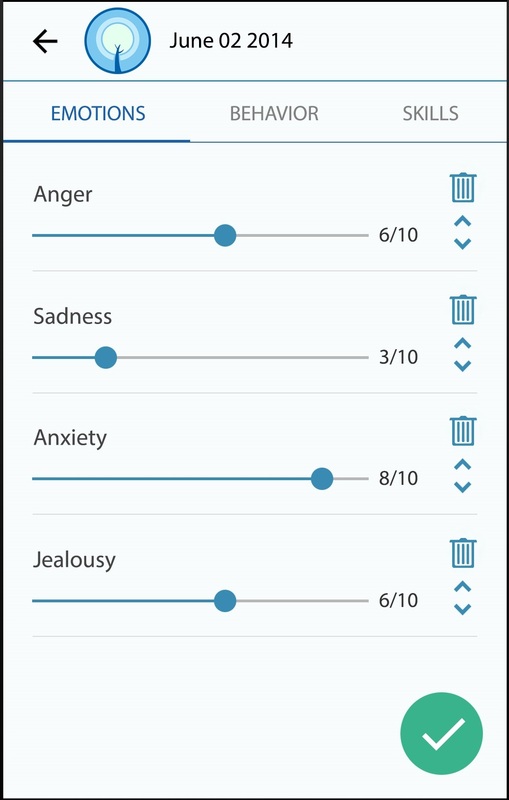 The app will contain detailed descriptions, practice tips and rationale based on the skills used in Dialectical Behavior Therapy which have been proven effective in helping people with varies difficulties – much due to its focus on learning effective skills. The skills are divided into six modules: Mindfulness, Interpersonal Skills, Emotion Regulation, and Distress Tolerance, Validation and Problemsolving. 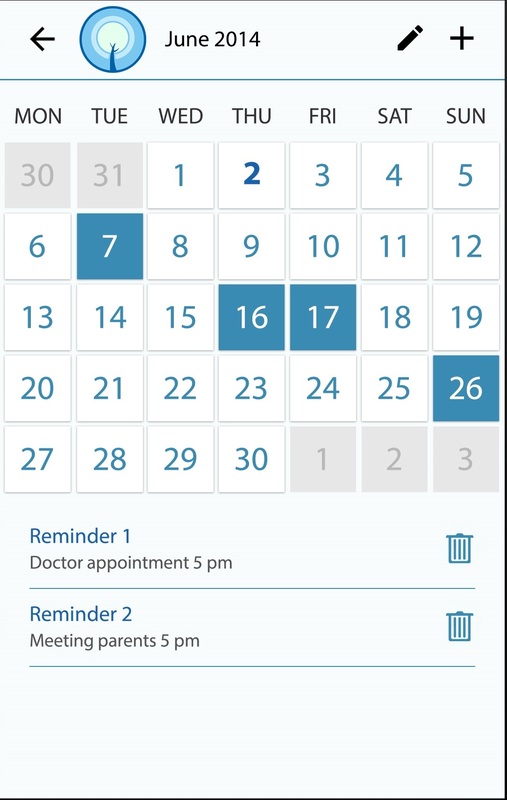 Using the Diary Card you will be able to monitor your target behaviors, emotions and the skills you train or use at a daily basis. This will give you a deeper understanding of both patterns in emotions and behaviors and the progress you´ll make as you train your skills and use them in your life. Learn about emotions, relations, awareness and behaviors. Learn, practice and use skills from areas of Mindfulness, Interpersonal effectiviness, Emotion regulation, Validation, Problemsolving and Distress tolerance. Register results and reflections from 18 different skill practice (handouts) sessions. Do your own behavioral analysis using chain analysis work sheets. Monitor your mood, behaviors and skills using a Diary card. Use a home work or to do list to keep track of assignments and planned activities. 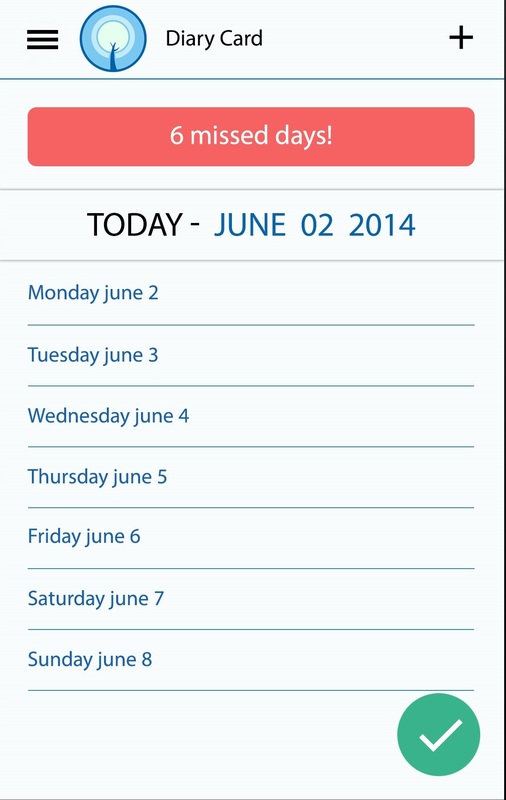 Send your diary cards and practice sessions by mail as HTML or CSV. Use reminders to for exemple fill out your diary card or practice particular skills. Create any number of personalized skill lists with the skills of your choice. 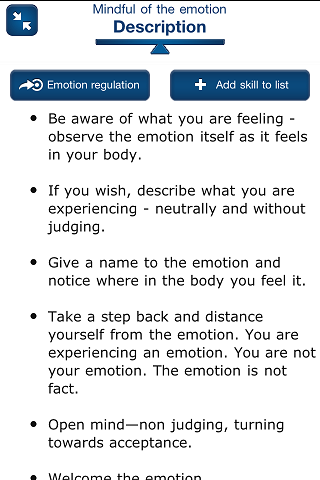 DBT Self-help & Diary Card app aims to help people who are struggling with emotional pain, destructive behaviors and relations or to people who feel they wish to increase their performance within the fields of emotion regulation, relationsships and problem solving. 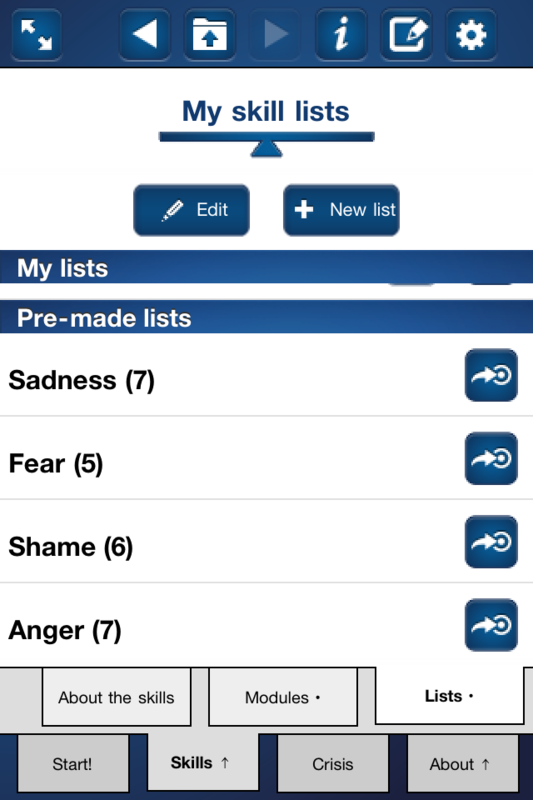 If you are currently in a DBT therapy program the DBT Self-help & Diary Card app can enhance your skill acquisition and skill generalization, and you will find the skill list function extremely useful, making your personalized lists for easy access to your skills. The Diary Card function helps you to monitor your moods, behaviors you wish to change and the skills you are using. You can then choose to send the data to your therapist as a pdf or excel file. 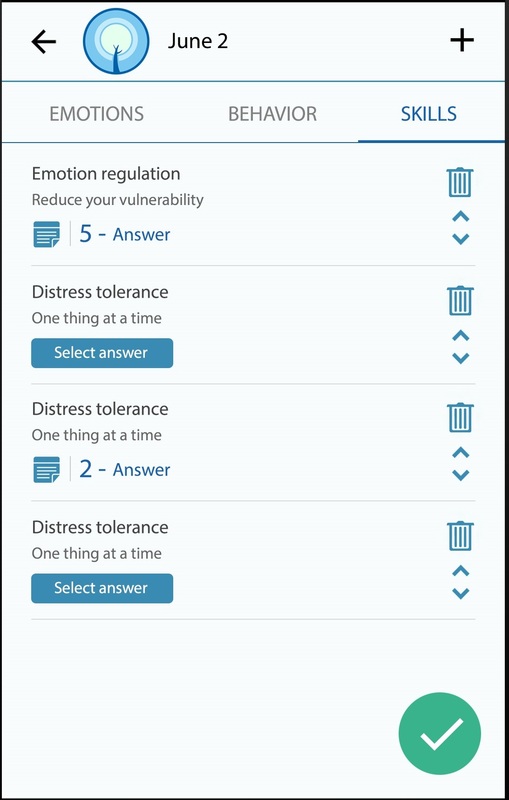 If you are a CBT or DBT therapist the app will be a useful resource to have easy access to skills for coaching and interventions. The skill lists can be used to keep track of individual clients crisis skills to make telephone coaching more effective. This app will be a powerful tool for anyone that want to more effectively manage overwhelming emotions, break destructive impulsive behaviors, navigate relationships, solving problems and increase their ability to stay focused in the present moment. 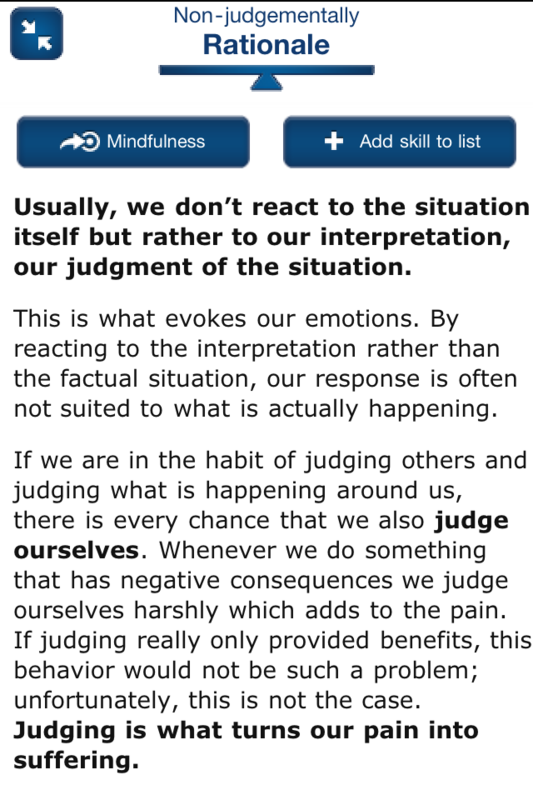 This app is a perfect complement to an actual in-person DBT program for people who really need this therapy. I suspect it could also be amazing for people who don’t think they need (or can’t afford) regular DBT, and are motivated to do the work themselves. The information in this app is worth hundreds/thousands of $$$$. DBT Self-help is a tool that helps you manage overwhelming emotions, break destructive impulsive behaviors, navigate relationships and cultivate mindfulness. It contains skill descriptions complete with rationale and practice tips that will enable you to develop and practice the needed skills. The skills are based upon the principles and skills taught in Dialectical Behavioral Therapy skill classes. 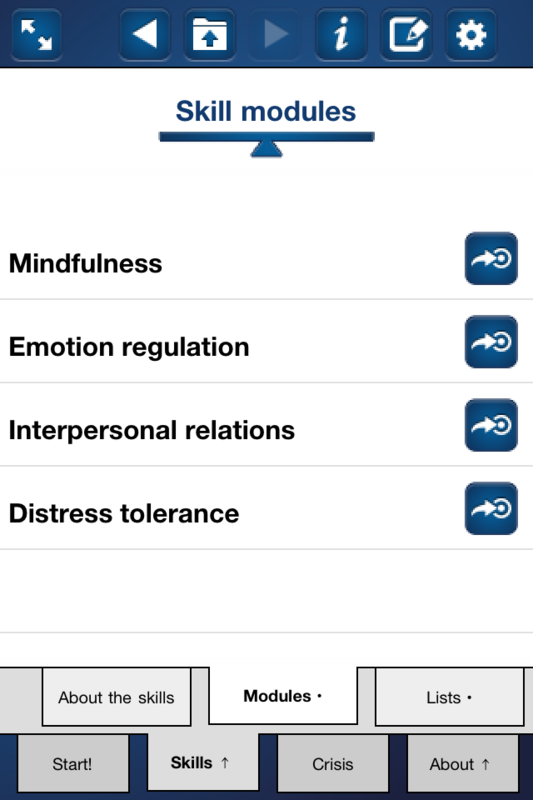 The app can be used in conjunction with psychotherapy or as a standalone self-help intervention as the skills can be implemented into many situations and settings. This app will be supported until the end of 2014 as we are currently working on a new app, The DBT Self-help & Diary Card app that will make this older app obsolete so we strongly suggest you investigate the DBT Self-help & Diary Card app and joins our campaign to develop it. Are you experiencing difficulties with feelings and emotion-driven impulsive behaviors? Are you having difficulties maintaining positive relations, ending destructive relationships or safeguarding your self-respect while reaching your interpersonal goals? Intrusive distressing thoughts and overwhelming emotions are at the heart of many problems. 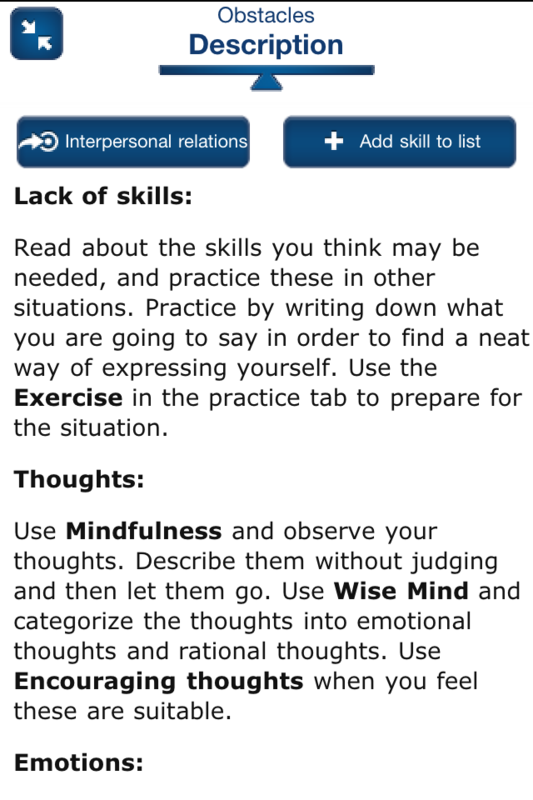 The skills of the DBT Self-help app can help you to manage and to find more effective ways to deal with your issues. 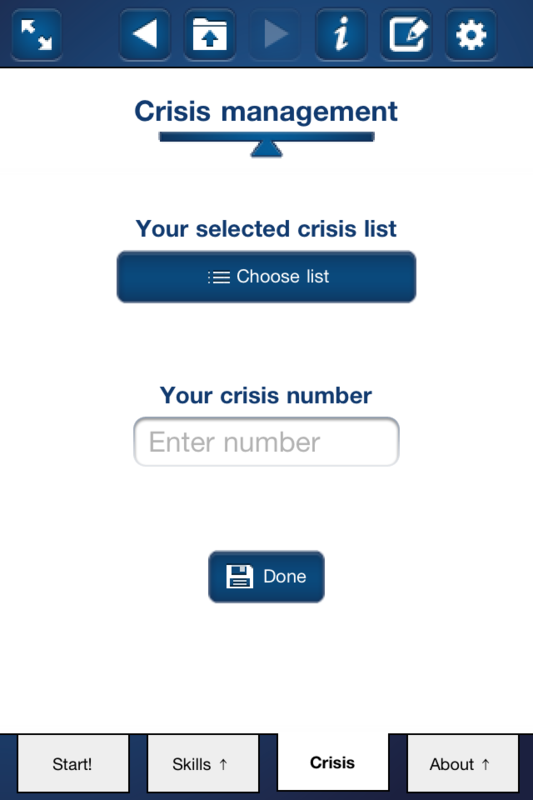 If you are in DBT therapy the DBT Self-help app can enhance skill acquisition and skill generalization, and you will find the Crisis skill list function extremely useful. The app can help you maintain your efficiency with the skills once therapy is over and you move on to build your life. 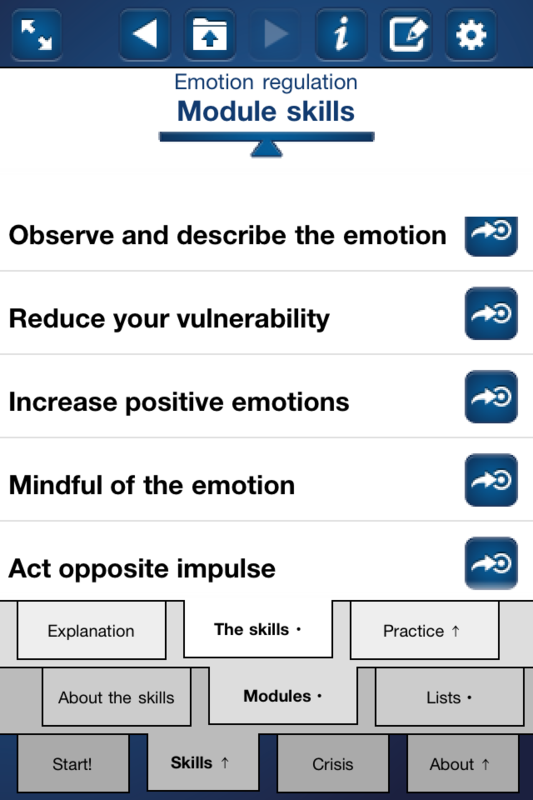 If you are a DBT therapist the app will be a useful resource to have easy access to skills for coaching and interventions. 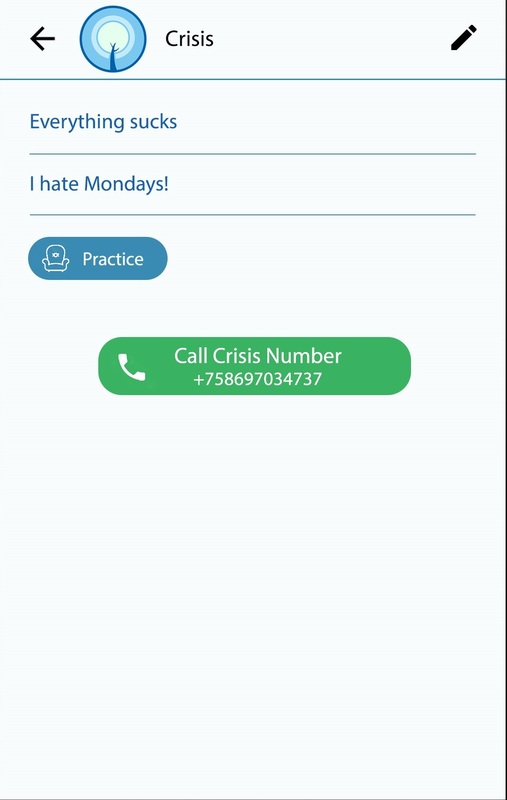 The feature of skill lists can be used to keep track of individual clients crisis skills to make telephone coaching more effective. Dialectical Behavior Therapy belongs to the third wave of Cognitive Behavioral Therapy combining learning and cognitive theory with the wisdom and effectiveness of mindfulness – dialectics to balance change and acceptance. Increase your level of mindfulness and cultivate your awareness and concentration. The app supports the following languages: English, Swedish.